Having servants was a status symbol in the Victorian era. Many households with a domestic servant only had one, who was expected to perform all of the tasks described in my last post. She cooked, cleaned, cared for children, stoked the fires, served meals, took callers, and served at the beck and call of the family. Domestic servants in these situations felt that it was too much work, and understandably so. Additionally, being the only servant could cause these domestics to feel incredibly lonely. Servants constantly searched for better household situations. More servants in a household meant a greater division of labor, which meant a more manageable workload for each servant. A position at the Gibson House, where there were sever servants, might have been quite coveted because there was an adequate division of labor. The downside to being in a home with multiple servants was that there might not be adequate living space for everyone. Living quarters might be above the kitchen or in the attic, meaning the space would be extremely hot in the summer, and extremely cold in the winter. Kitchens were often dark and gloomy, with little sunlight. At least one domestic servant in New England described living above an attic with three other servants, and inadequate sanitary conditions. 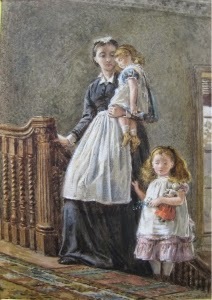 Nursemaids often didn’t have their own room, and instead had to sleep in the same room as the children they cared for. Conditions like these might have also driven a servant to look for a better position. The Gibson House’s servant quarters were much more comfortable than many of the period. Five of the servants lived on the fifth floor of the house, which has four bedrooms. The heat from the central ventilation shaft probably didn’t reach up to the fifth floor, but two of the rooms had fireplaces. There’s also a bathroom on that floor. The governess had her own room next to the nursery on the fourth floor. The kitchen, where the servants would have taken their meals and spent much of their free time, can be dark and gloomy, but it does have several windows for ventilation and light to enter the room.So it seems that in terms of accommodations and workload, a position at the Gibson House was probably better than most available to domestic servants at the time. But we must also consider what the Gibsons were like as employers, since one of the most important factors in the quality of life of a domestic servant was the family on eworked for. Speaking of Ethel, next time we’ll talk about another neighbor she grew up with, and ended up marrying, Freeman Allen. Lynch-Brennan, Margaret. The Irish Bridget: Irish Immigrant Women in Domestic Service in America, 1840-1930. 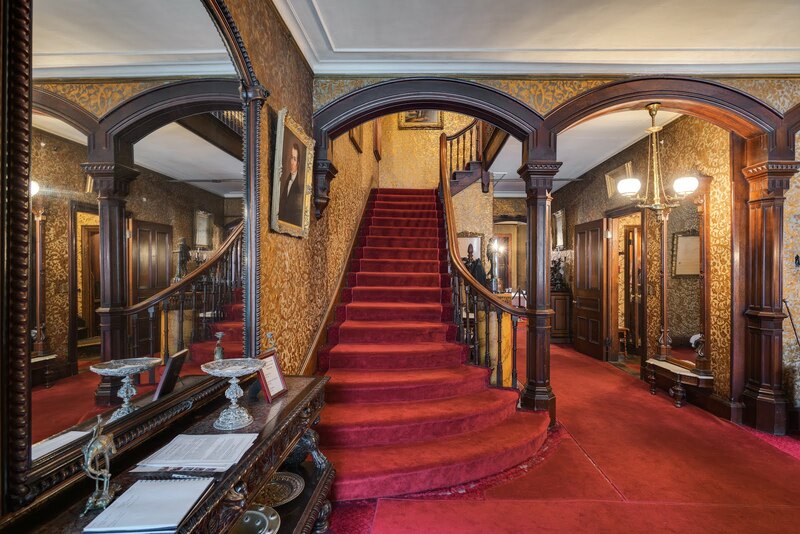 In the twenty-first century, it can be difficult to grasp the very idea that the Gibson House had more servants than family members in 1880. It seems wildly luxurious— and with thirteen people sharing those back stairs, really crowded! Today I’ll be looking at the servants of the Gibson family, and what their roles were. Records about the Gibson House servants are frustratingly scarce. The best records we have are the 1880 census and Rosamond Gibson’s memoir. By combining this documentation with general historical trends, we can piece together a picture of domestic servant life in the Gibson House. So, what would each of these seven servants have been doing? We aren’t sure of each person’s specific role, but we have an idea of how the work would have been distributed. William Austin, the one male servant, was probably a man-of-all-work. He kept up the coal furnace, took deliveries, and might have polished shoes and cleaned windows. We do know he was not a butler. In America, only the wealthiest families (think the Vanderbilts) had a butler, and usually these high-level servants were brought over from England. One servant would have been the nursemaid, or governess. The nursemaid took care of the Gibson children. She washed, dressed, fed, and played with them. Although Rosamond did spend time with her children, most of their care was provided by the nursemaid. Sometime after 1880, Rosamond hired a French Swiss girl named Elisa Rolland as the children’s governess, in the hopes that she would pass along some knowledge of the French language . One servant would have served the role of parlor maid. The parlor maid was in charge of receiving visitors, taking their calling cards, and announcing them to the family. She also had the role of a waitress, setting the table, bringing food out to the family, and washing dishes and china after meals. Two of the servants would have been chambermaids. Chambermaids were in charge of keeping the house clean. They cleaned bedrooms and parlors, cared for fires, beat carpets, and polished the floors. It can be difficult for us to grasp just how [already used “difficult” in sentence]arduous[? ]and time consuming this work could be. For one thing, houses got dirtier more quickly in this time period because of the ash from fireplaces. Just polishing floors might take an entire day, considering that a thorough polisher was expected to rub each spot of floor for thirty minutes with a piece of flannel! The chambermaids were also expected to serve the family’s needs, and were at the beck and call of the call bells located in the kitchen. The last servant was possibly a lady’s maid. A lady’s maid would have been in charge of helping Rosamond get dressed and undressed. She also would have cared for Rosamond’s wardrobe, including basic mending and removal of stains. She, rather than one of the chambermaids, also could have been responsible for keeping Rosamond’s room in shape, making sure everything was always in top condition. With so many moving parts, the Gibson House must have been constantly buzzing. What was the relationship like between Rosamond and her servants? What was a servant’s free time like? How did domestic servant life in the Gibson House compare to other homes in New England? I’ll delve into these topics a little further next time. Image above: Cartoons depicting Irish servants, referred to as Irish "Bridgets," were common and unflattering. The above image depicts a stereotype of Irish domestic servants, but not necessarily a reality. Jerome, Steve. Below Stairs 1890-1900: American Society in the New Century 1890-1920. Lynch-Brennan, Margaret. The Irish Bridget: Irish Immigrant Women in Domestic Servince in America, 1840-1930.